Over 1,000 attendees from across the country gathered in San Francisco for the third annual Carnegie Foundation for the Advancement of Teaching’s Summit on Improvement in Education. This summit, the largest to date, offered practitioners, researchers, and district and nonprofit leaders the opportunity to interact with colleagues, attend compelling workshops and presentations on the cutting edge of improvement science in education, and hear from leaders in the field like Carnegie Foundation president Anthony Bryk. Among the attendees at the conference were five representatives from Eskolta School Research and Design. Eskolta staff members were presenters in two sessions at the conference. 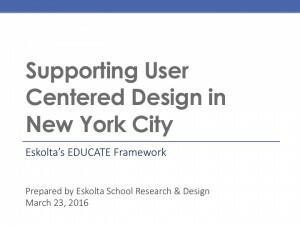 Tom McKenna and Alicia Wolcott presented on user-centered design in New York City Schools, focusing on the influence of design thinking on Eskolta’s approach to school improvement. Dr. Amanda Crowell presented on Eskolta’s work in leading the New York City efforts in engaging with the national Student Agency Improvement Community, highlighting our collaboration with both the Carnegie Foundation and the New York City Department of Education. Both sessions allowed educators and leaders from around the country a deeper view into the range and scope of Eskolta’s work with schools and districts, and spotlighted Eskolta preeminence in facilitating improvement-science-based initiatives in New York City. In addition to Eskolta’s forward-facing participation in the conference, more went on behind the scenes. In an invitational dinner, Executive Director Michael Rothman joined 40 other education leaders from around the country to discuss the future of improvement science in education with Carnegie president Anthony Bryk.